The Vanaire product line of air pollution control equipment includes fume scrubbers, centrifugal fans and blowers, hoods, duct, complete ventilation systems, NOX systems, mist eliminators, air strippers, process tanks, air strippers, atmospheric evaporators, containment systems and much more. Superior manufacturing expertise coupled with exceptional ventilation equipment manufacturing makes Vanaire the leader in the air pollution control industry. All of our air scrubbing equipment is made from corrosion-resistant materials such as PVC, CPVC, FRP, PP, PVDF and dual laminates, which guarantees extended equipment lifespan in the harshest environments. Vanaire products not only clean the air in manufacturing areas, we also emit safe air into the environment. We also provide a low maintenance product profile that's as dependable as it is efficient. Working with our clients, we focus on customized engineering, manufacturing and installation services, designing our centrifugal fans, hoods, air scrubbers, mist eliminators, ductwork, hoods, system controls and other air scrubbing equipment to meet and often exceed their needs and requirements. 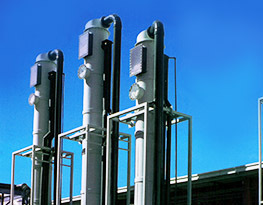 Our objective is to build and install innovative, top quality air pollution equipment required for specified manufacturing applications such as Surface and Metal Finishing, Steel Pickling, Chemical Manufacturing, Textiles, Semiconductor Manufacturing, Municipal wastewater, Automotive, Food Processing, Pharmaceutical and much more. Our design team of expert, highly qualified and experienced engineers accomplish this goal by transforming advanced, innovative air cleaning concepts into state-of-the-art air pollution scrubbing solutions. This air pollution control equipment we manufacture and install specifically for each client results in cleaner air for all the employees inside the manufacturing area and environmentally safe air emitted to the atmosphere for all the population to breath healthier. Our team consists of a select group of highly qualified, knowledgeable engineers, each of whom has a solid understanding and experience of the intricate processes that go into developing cutting edge air pollution control systems. We've dedicated over 30 years towards perfecting the design, manufacture and installation of specialized air pollution equipment that exceeds customer requirements. In that time, we've established ourselves as the industry leaders and go-to providers of air scrubbing systems, with our equipment and services providing ventilation equipment to manufacturing facilities across North America and the world cleaning the air in the harshest environments. In addition to engineering, manufacturing and installation of Vanaire air pollution control systems, we also provide extensive maintenance services. That's a huge responsibility, but it's a burden we're equipped to handle because of our established expertise and experience. We deliver businesses with clean air at their manufacturing facilities, we select only the most robust corrosion resistant materials, and we build exceptional equipment, adopting a groundbreaking approach when designing and constructing every air scrubbing equipment solution.